Don’t’ let the rain get in the way of your practice. There are a lot of things that you can do to improve your swing and get you ready for the better weather. Just make sure you do not hit the celling or the walls…may lead to some troubles that are not golf related. To hit it farther, SLOW DOWN! When taking practice swings at home (and on the range and course), slow down your speed. The idea behind a practice swing is to create a feel of what you are trying to do. You CANNOT change a position or create a feel when going full out…it is not how our brains operate. When taking slow swings, you can feel what the club is doing and you are able to check your positions. 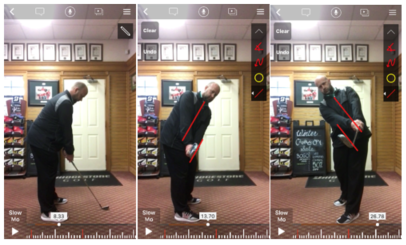 Below are a few positions to check that will help with your impact and ball striking. 1. Setup- Make sure that your weight is under your shoe laces and you are well balanced and your arms hang down and are relaxed. 2. Takeaway- With a good core turn, stop the club when it is parallel to the ground. Check to make sure that the club is also parallel to your toe line. The other check point is that the leading edge (short red line) matches the sternum (longer red line). 3. Follow through- Also with a good core turn, go through the impact area and stop at waist high. Make sure that you turned through well and the leading edge matches the sternum, like on the takeaway, and the lead wrist is flat. By doing this simple motion, SLOWLY, you will gain a better feel on how the body and club move through impact. Take this feel to the range and the course and, if done correctly, the ball will fly straighter and farther.